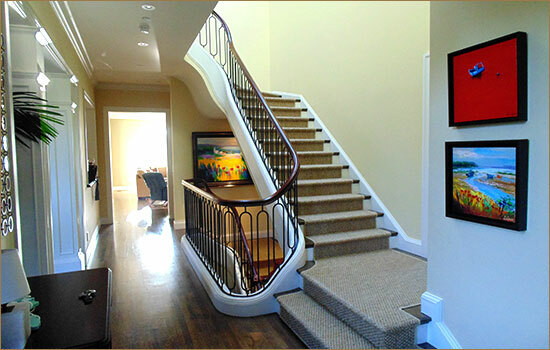 De Martini/Arnott Painting Company offers interior painting with the highest standard of excellence. They will bring new life to the the interior of your home—all the while delivering outstanding professional service at competitive prices. Serving the San Francisco Bay Area and the Peninsula. De Martini/Arnott will work with you to accommodate household or business schedules, pets or any other household related issues. Your painting team will move furniture and cover all of your belongings and exposed surfaces to protect your valuable property. Because of the number of painters on each crew, prep work and painting are completed fast and efficiently—minimizing disruption. The painters will clean up at the end of each day so you don’t have to deal with unnecessary mess in your home. Once the job is finished, they will return your furniture to its original location, clean up all paint-related debris and vacuum the floors. They leave nothing behind except for a beautiful interior finish. De Martini/Arnott’s service is second to none, and they do everything possible to maintain their reputation as the top San Francisco Bay Area house painting company. What do I need to do to prepare for interior painting? All we ask is that clients remove breakables, decorations off walls and any ornate items such as those in china cabinets, for example. We will handle all of the rest. Do you use low VOC or No VOC paint? Absolutely. California has stringent standards for VOC (volatile organic compounds) levels in paints and finishes, and the manufacturers have started offering many environmentally friendly options. We can help you choose one that works best for your needs. Will you fix damaged drywall? Yes. We can do minor repairs and replacement work on wallboards.